Present a delicious selection of foods on a variety of luxury serving platters, from Amara with a wide selection from traditional oval shapes to innovative styles created by designer brands, choose a platter to suit both a setting and food group, with bold patterns, chic finishes and colours to match existing tableware or to make a statement. 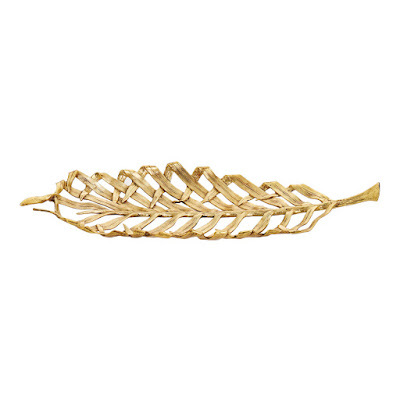 Add a dash of opulence to the table with these Deco Leaves serving tray from L’Objet. 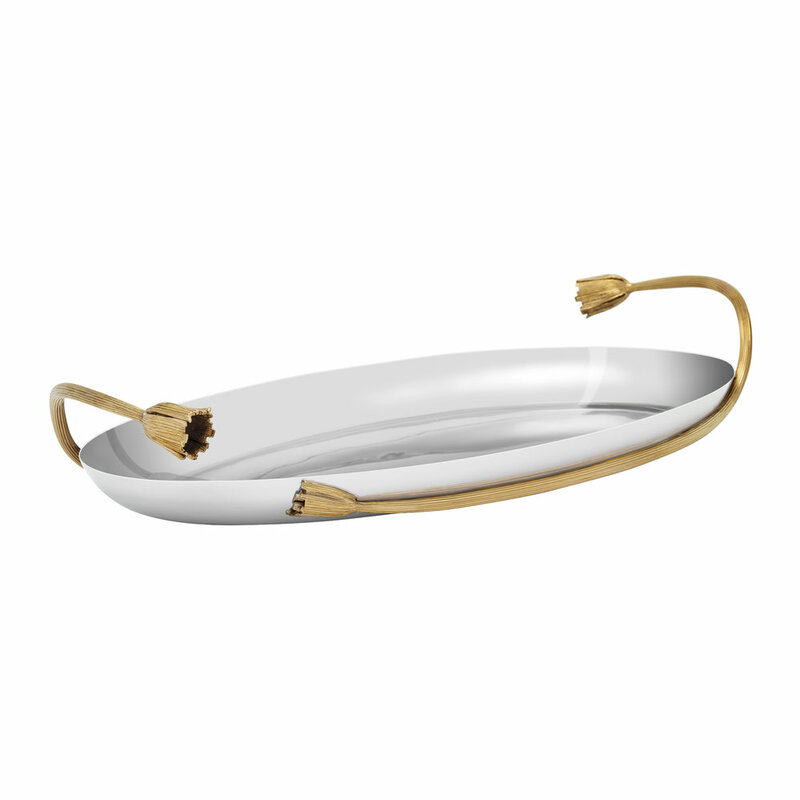 In an oval shape, this tray has been crafted from hand-forged stainless steel surrounded with 24ct gold plate flowers and vines. Part of the exquisite Tulum collection, it is inspired by the ancient Mayan culture and is ideal for serving drinks or canapés at glamorous parties. Serve a selection of foods in ultimate indulgence with this Clair De Lune Uni Oval Dish from Haviland. 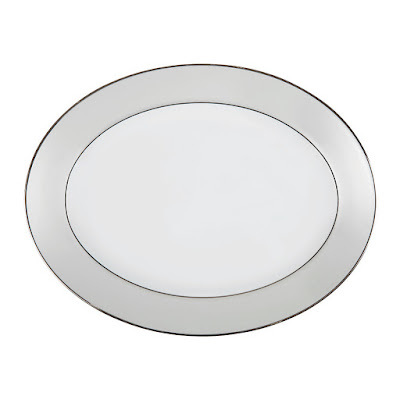 Crafted using Limoges porcelain, this oval dish boasts curving silver detail around the rim injecting an element of elegance. Perfect for presenting meats or pre-dinner nibbles to guests, team with matching pieces from the Clair De Lune Uni Collection to transform the dinner setting. Bring high fashion to the dinner table with this beautiful Butterfly Parade platter from the Christian Lacroix Tales of Porcelain collection. Created in partnership with prestigious porcelain makers Vista Alegre, the fashion house has combined its unique designs with fine porcelain to create a must have tableware collection. 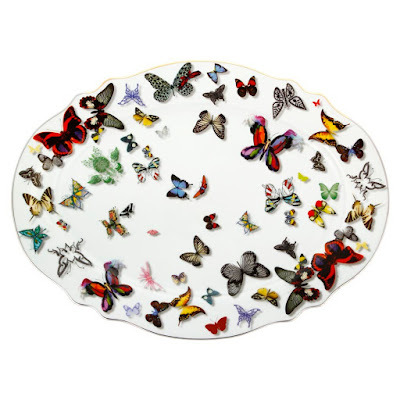 This striking platter features a beautiful three dimensional effect butterfly design on a bright white background with gold coloured rim. Infuse any space with unique design with this Palm serving platter from Michael Aram. Majestic in design, the Palm collection from Michael Aram is inspired by the beauty of the windswept trees and the whole range exudes comfortable luxury and graciousness. A striking addition to any dinner table, this centrepiece platter depicts a fallen frond with delicately curved edges made from antique finished goldtone and has been crafted entirely by hand by skilled artisans in India. 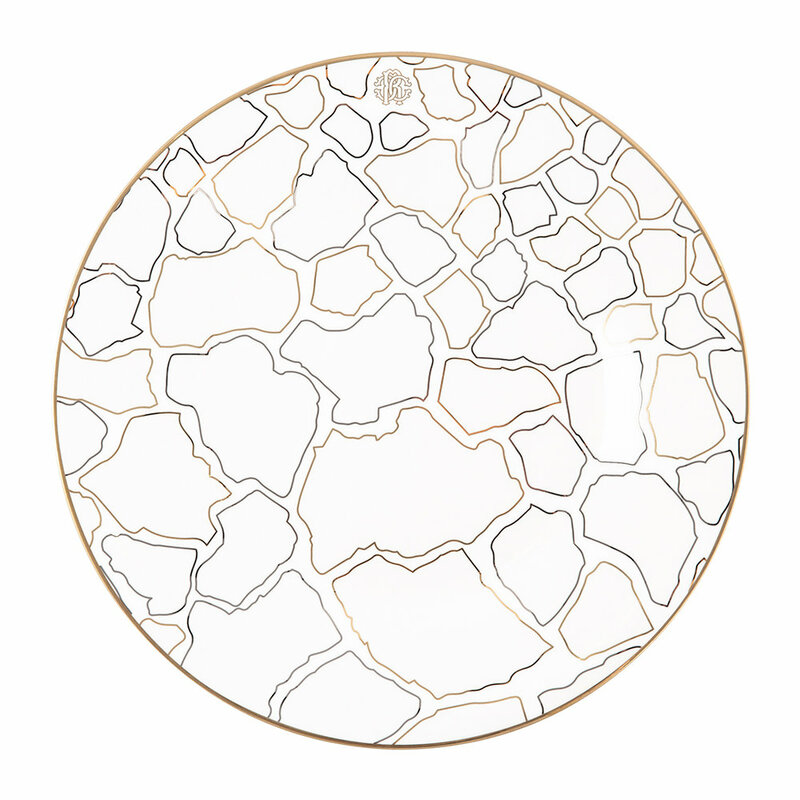 Create an opulent dinner table with this Giraffe charger plate from Roberto Cavalli. 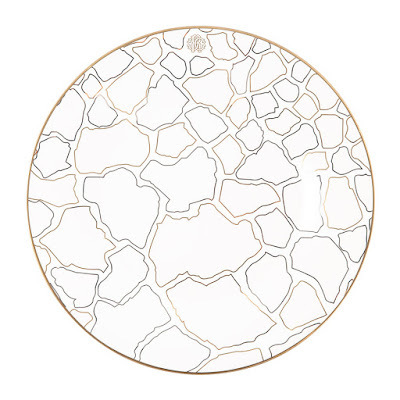 Crafted from fine bone china, this charger plate is adorned with a giraffe design and enhanced with luxurious gold and platinum coloured detail. Finished with a Roberto Cavalli monogram, this plate is the perfect complement to a luxurious table setting and looks fabulous paired with more tableware from the decadent Giraffe collection. Serve your guests in style with this Large Platter from Tina Frey Designs. Handmade by Tina Frey from solid polished brass, it has a unique, sculpted form and is food safe & lead free. 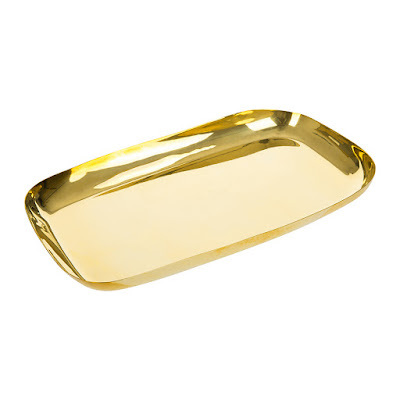 A welcome addition to your home, pair this platter with more pieces from Tina Frey to stylishly coordinate any setting. 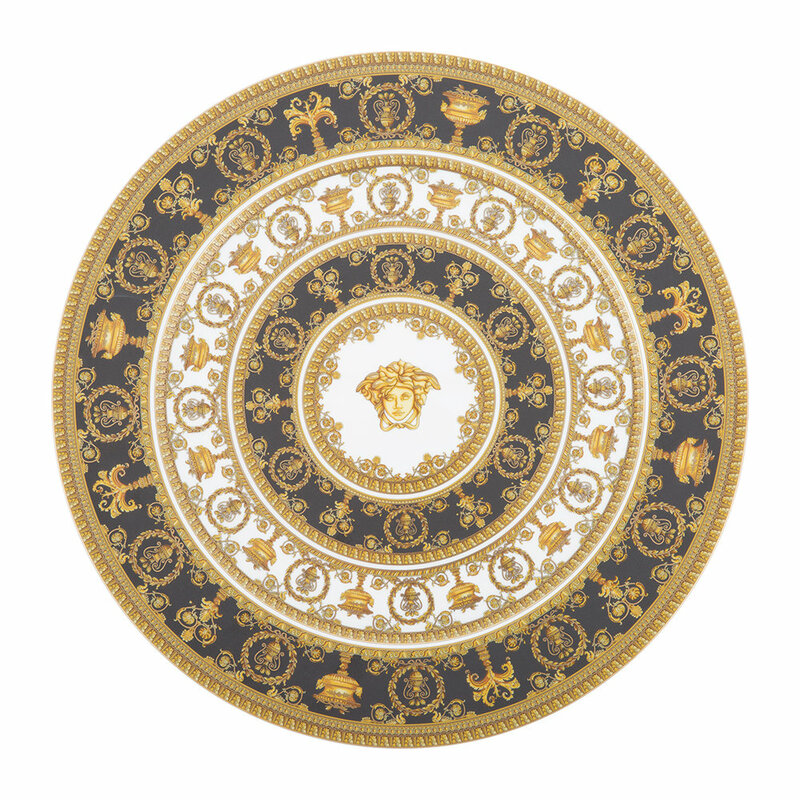 Add an ornate flair to any table setting with this I Love Baroque serving plate from Versace. With a concentric ring design, this serving plate is adorned with a classical Baroque design synonymous with the fashion house. Crafted from the finest porcelain, it is ideal for serving all sorts of dishes and courses for stylish dinner parties. 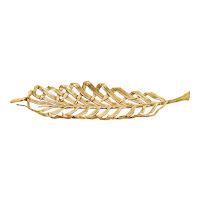 Add rustic charm to any setting with this Olive Branch serving board from Michael Aram. 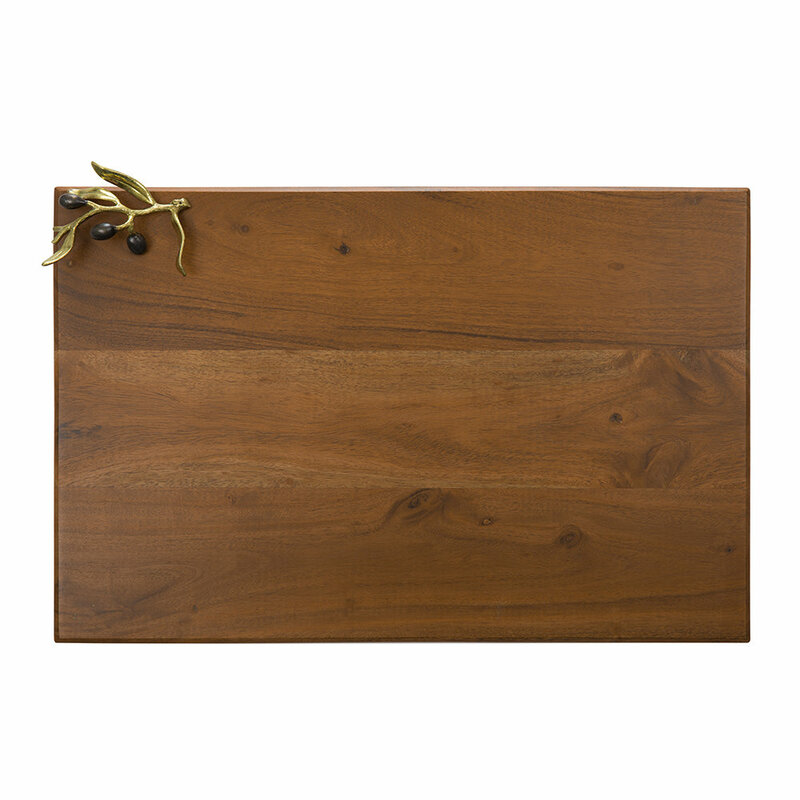 In rich, warm wood, this board is fabulous for serving cheeses or desserts at dinner parties. Inspired by peace and victory, it has a single olive branch sculpture in one corner crafted from shining and oxidised brass.